Let us refer to a scene from the end of the movie The Matrix. 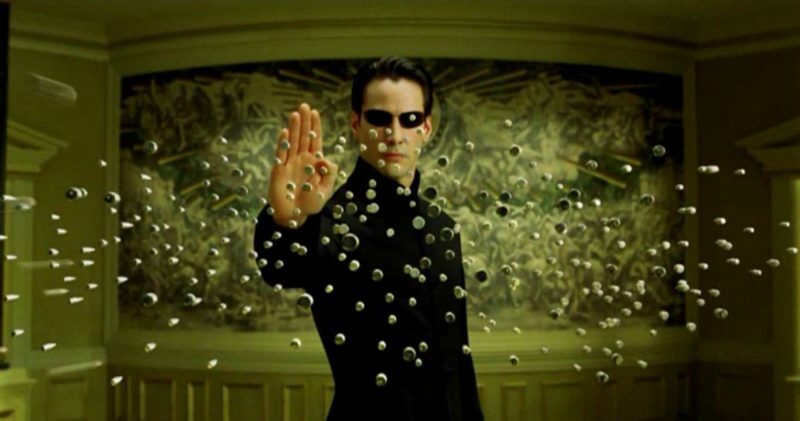 The protagonist, Neo, manages to change his focus and instead of seeing images of androids, weapons and bullets, he sees alphanumeric characters that quickly pass by, as if on a computer screen. Thanks to this, he can inhumanly operate on those computer programs, stop bullets aimed at him and cause them to fall, with a gesture. That’s what we analysts do. When someone fires their overflowing anguish at us, we read the (acoustic) images we hear, and, with inhuman releasement, take them as letters, make an interpretative operation and thus make the bullets fall with a gesture. Heidegger says that releasement and openness to mystery go together. When we achieve detachment with respect to any technical prescription, we do not respond to the urgency of the other’s anguish nor let ourselves be infected by it, but we must interpret, read what we hear. And in that moment, we recover a portion of the mystery that a body speaks to another body. We tend to forget that we are a body that addresses another body using articulated sounds. It is extremely strange. We establish all our relationships in that way. The mystery is that a speaking body addresses, with its anguish, another speaking body, hoping that it will resolve part of its own anguish. The mystery Lacan speaks about, the mystery of the speaking body, is a crazy thing! When we catch onto that, we’re on our way to reading the Matrix and stopping the bullets by hand. To do so, we must produce a series of articulated sounds that depend on having been able to read what we hear. That is the reason why analyst does not mean a profession nor a person, but a function. There is a Matrix of speaking bodies that address other speaking bodies. If, with that inhumanity and with enough releasement to stop the bullets, someone (who may not call himself a psychoanalyst, who may not have an office, who may not have studied psychology or medicine, who may not have been analysed) succeeds – by reading what he hears – to alter someone else’s economy, he would have been an analyst for this one – although neither of the two knows it. To receive the subject as such, including the mystery of being a speaking body, is to look at it as if it were a kind of oddity that has never before been seen in the universe and to try to grasp the peculiarities of the speech it utters, in order to see if we can decipher a fragment of the hieroglyph that that Matrix throws at us. That is the inhuman releasement with which we take in the Other: attentive to details, we jump like lions upon the slightest slip. To see the Matrix is not to be cold, but to be able to read. The mystery of the speaking body is that of a body that emits articulated sounds and that, in doing so, says much more than it intended to say. That is the Freudian unconscious. The meaning of analytic technique is to alter the subject’s economy of jouissances, and that is only achieved by means of the tools of interpretation, which require reading what we hear with an attitude of inhuman releasement.